Recently, I was preparing for a very cool brown-bag session at a client's offices, when I wanted to include a demonstration around product taxonomies. These structures are typically presented as some kind of a hierarchy/tree on many eCommerce websites - and are very well known by online users. So I wanted to find a taxonomy, and here here, Google immediately came to the rescue. I found this page on the Google Merchant Center. 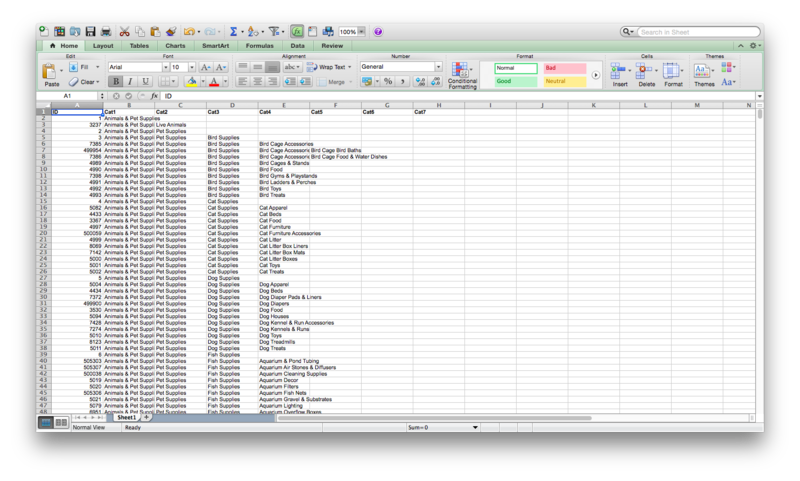 You can follow the link to the Excel file, and boom - there's your product Taxonomy for you. In Excel I quickly converted it to CSV, so that I could import it into Neo4j pretty easily. The CSV file is of course on github. connecting the top-level categories (labeled as Cat1) to the "taxonomy node". 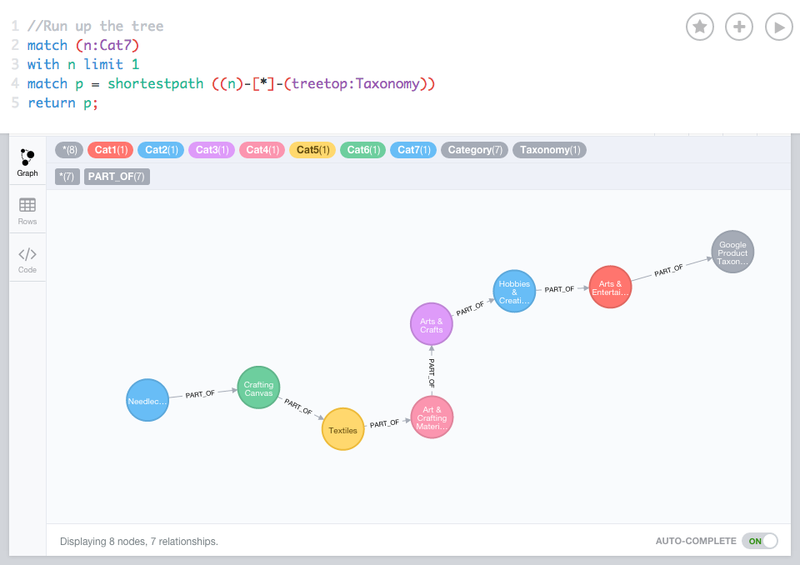 You could indeed imagine to have multiple taxonomies living happily side by side in your graphdb. ensuring that the "current level" categories are not null, so that we don't need to worry about empty nodes. ensuring that the "next level" categories are "null" so that we only have to create the nodes at that particular level of categorisation. 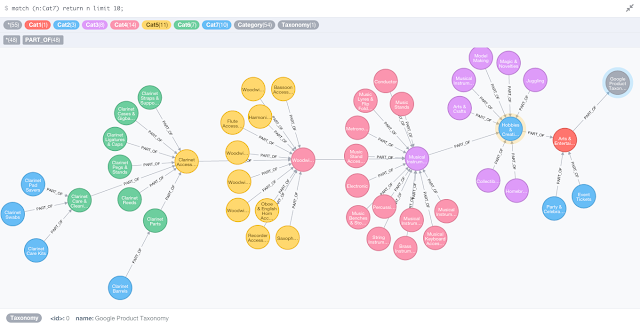 assigning two labels to every taxonomy element: one for the "level" that they are in ("Cat1", "Cat2", "Cat3", etc), and one ("Category") for clarifying that this part of the graph is in fact the taxonomy. We have also created the appropriate indexes beforehand, so that the MERGE operations would go smoothly. But in the real world you could probably see how you could really link actual products into the taxonomy and find out meaningful information. Like in this example, where you try to find out the links between an Apple iPhone and a Samsung Chromebook. That's about it for now. I hope you found this useful, and welcome any questions and comments as usual. Hi Rik, this is great and really fun to play around with! 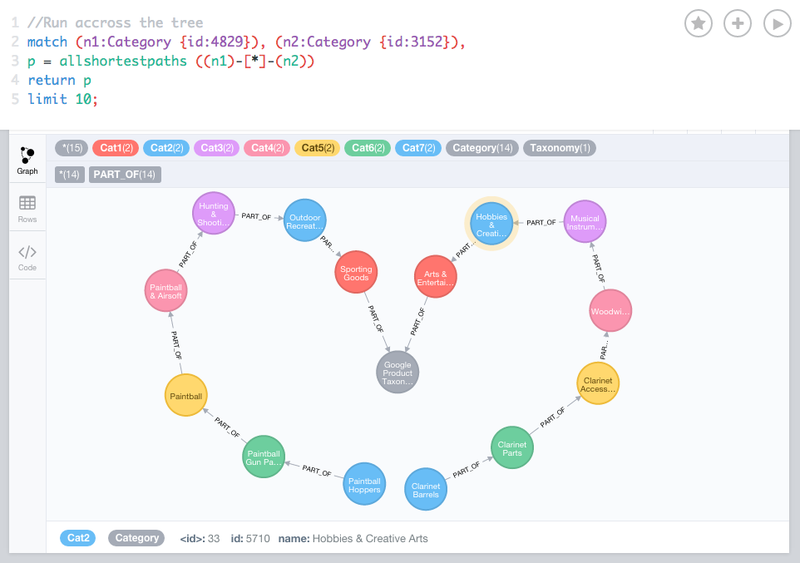 See http://neo4j.com/developer/guide-neo4j-browser/#_styling_neo4j_browser_visualization for some info? Let me know if that helps.